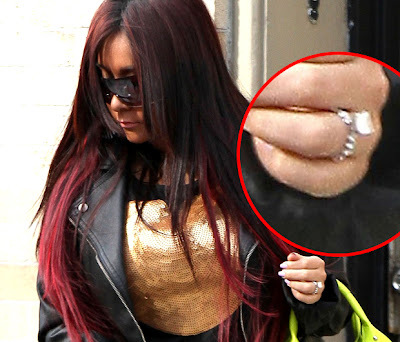 Clever Bulletin: First look: Snooki's engagement ring? First look: Snooki's engagement ring? Pregnant and engaged all within a week? Pregnant and engaged all within a week? Snooki ought to slow down! The Jersey Shore star fed fire to rumours she'll be getting hitched to boyfriend Jionni LaValle, stepping out wearing what appeared to be an engagement ring. The 24-year-old, who is also reportedly knocked-up, made no effort to hide her rockin' bling as she walked her pooch in Jersey City.